For the Love of Character: Oh Christmas Tree! Decked our house with balloons and garlands! With a one year old and needing a new tree, I decided to have fun this year. In the past, we have gotten real trees, but we realized last year having to keep the house warmer for Elizabeth, the tree died rather quickly. I was researching good fake trees and found some flocked options that I liked, but after thinking about it decided to hold off for a year. EM is at the age where she gets into, pulls on and messes with everything. I figured flocked snow would be eaten, ornaments broken and messes all over. After seeing an adorable balloon tree on Instagram, I decided what a fun way to still have a tree, and try out a new concept for the shop! After playing with some colors, we decided to mix pastels and pearly dark colors for the tree. I love the mix against my light bluish grey walls. Plus the settle pink added a fun girly touch for my little miss. We maybe like pink in this house! I think there are so many fun color possibilities with these trees. Pink Santa ended up being the perfect tree topper! After finishing off the balloon monstrosity, I decided to keep going with our decorations. I pulled out some of my favorites from the past, and mixed in some new from the shop this year - I've been crushing our bottle brush trees since we got them in! Grabbed a few pink and love them with my paintings. Still a few of those left in the shop! Last year, I snagged some pretty faux greenery garland (since the live died quicker than the tree did) and they work great on my dresser and mantel. Stockings, I use traditional velvet stockings from my childhood - love the bell! Reminds me of Christmas Eve night hearing them get stuffed by Santa. Elizabeth got in the holiday spirit with me today for photos and rocked her adorable new Christmas bow by Avery & Grey - one of these beauties left in the shop! The red glitter candle is my favorite Volcano scent and is also available in the shop, as well as other holiday scents and containers. If you aren't quirky and crazy like me, and actually put up a real tree, make sure to check out our fun ornaments before they're all gone. We got in so many fun ones this year! Thinking I still need to do a cute tree for EM's room using some of these. Hope your decorating is going well! What's your favorite item to get out every year? So sorry, this just came through b/c of spam issues. If you look up DIY balloon garlands that might help! Then you can connect the garlands together. I've also seen flat ones on a wall using glue dots or against a cone structure made from poster board using glue dots. We make them on a regular basis, so have different techniques that are hard to type out. Maybe you can do next year! 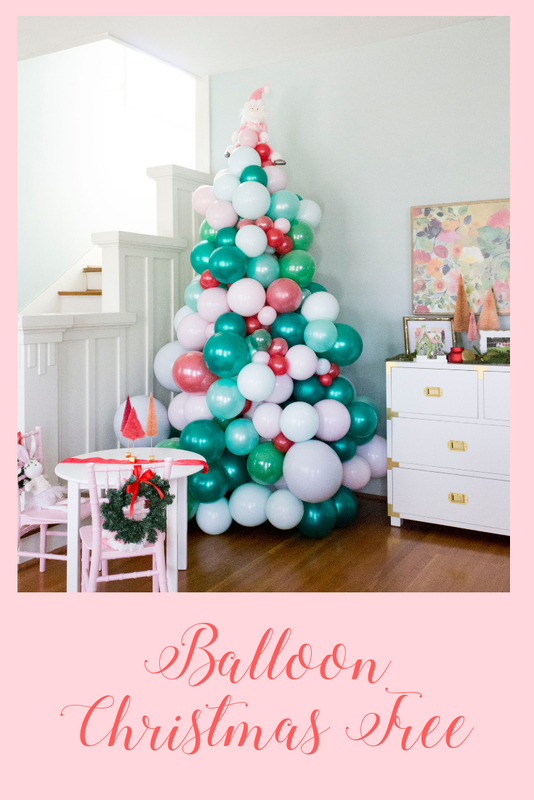 Or using balloons on a tree as decoration can be a fun, cheap option as well.